Mashed cauliflower is mixed with cream cheese, butter, cream, garlic and horseradish sauce for an extra zip of flavor! 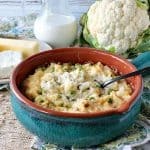 Even if you’re not a huge cauliflower fan, I hope you’ll give this recipe for Easy Cheesy Mashed Cauliflower Casserole try because I believe it will make you a cauliflower convert. Cauliflower is one of those magical vegetables that can be morphed into just about anything these days. 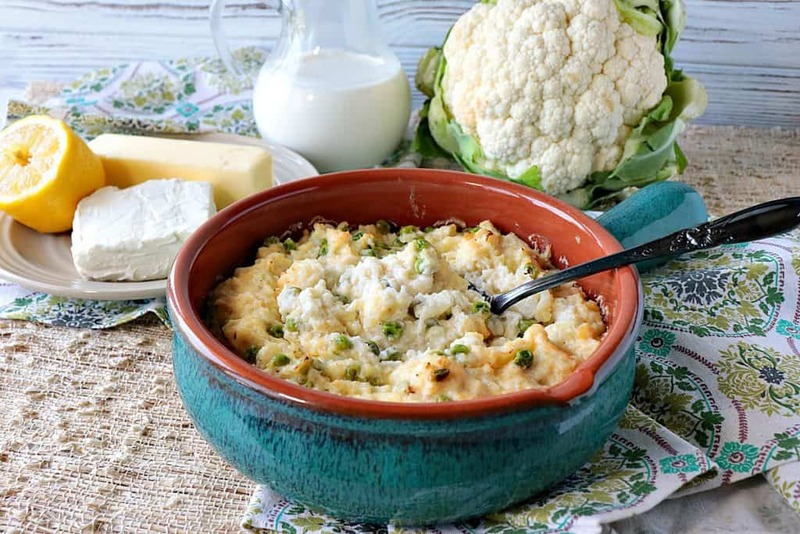 However, my favorite way to eat it is in this Easy Cheesy Cauliflower Casserole. I developed this recipe because we’ve been following a keto eating plan in my household. That said, I’ve served this dish to several people who aren’t following a keto plan, and also to one person who doesn’t enjoy cauliflower at all, and they all approved of this delicious and slightly zippy side dish. WIN! 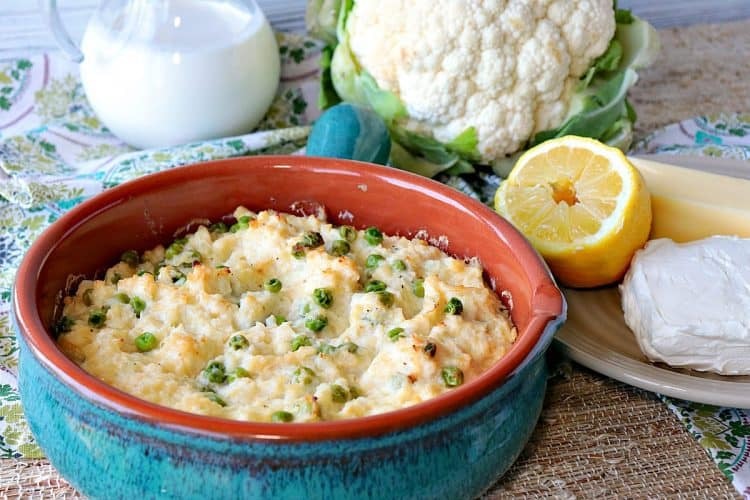 **Please Note – The printable recipe card with detailed instructions and complete ingredient measurements for making Easy Cheesy Mashed Cauliflower Casserole with Peas is available near the end of this post. 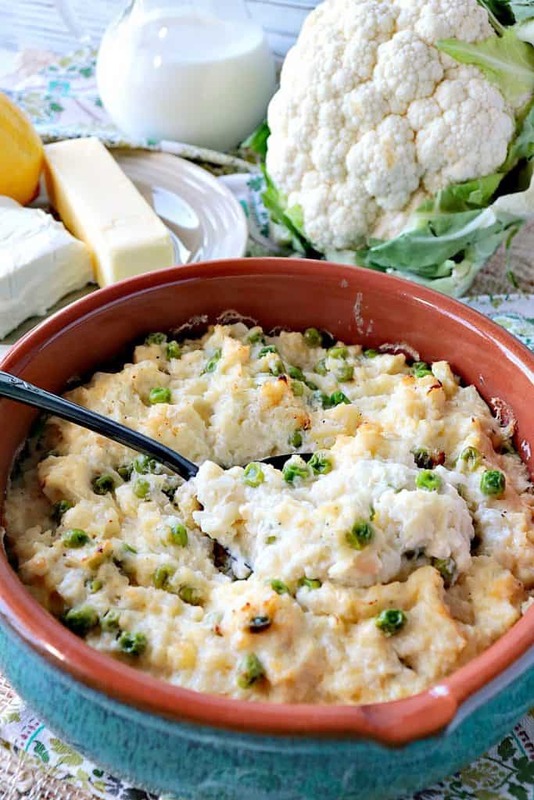 Cheesy Mashed Cauliflower Casserole with Peas is super simple to make, and you can mash the cauliflower to your desired consistency. For this recipe, I like to keep the cauliflower a little chunky, so it has more body than your typical mashed cauliflower side dish. But feel free to mash it to whatever fits your preference. Since this dish is heavily laden with cheese, cream, and butter, the importance of the horseradish and fresh lemon juice at the end cannot be overstated! 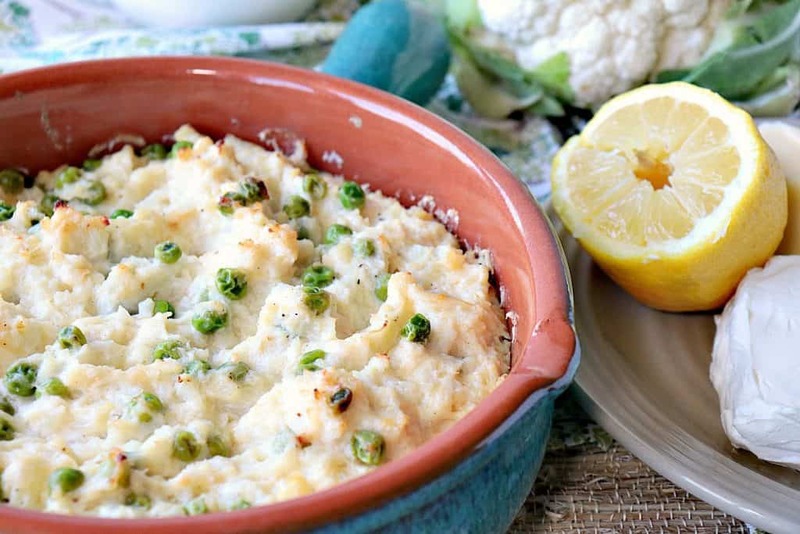 The fresh lemon juice cuts through the richness of the other ingredients and balances the flavors of this Easy Cheesy Mashed Cauliflower Casserole in a wonderfully delicious way, and the horseradish adds a little zip that wakes up the entire dish! Cut or break the florets off the cauliflower head. Discard the core and leaves. Add the florets to a large bowl. Cover with plastic wrap and microwave for 10 minutes until soft and tender. Mash the florets to your desired consistency. Add softened butter, cream cheese, garlic and heavy cream. Add fresh lemon juice, prepared horseradish, Parmesan cheese, salt, and pepper. Stir well. Add frozen peas and mix. Add the mixture to a 1½ quart baking dish and bake in a preheated 350-degree oven for 20-25 minutes. Serve hot. I adore how versatile cauliflower is. I almost always have it in my fridge. Cheesy Mashed Cauliflower Casserole is mixed with cream cheese, butter, cream, garlic and horseradish sauce for an extra zip of flavor! Place the cauliflower florets in a large bowl. Cover the bowl with plastic wrap and microwave for 10 minutes on high, or until the florets are soft and tender. Mash the florets with a potato masher. Add the remaining ingredients. Mash and mix to your desired consistency. Spoon the mixture into a 1½ quart baking dish which has been sprayed with cooking spray. Bake in a preheated oven for 20-25 minutes. Serve hot. 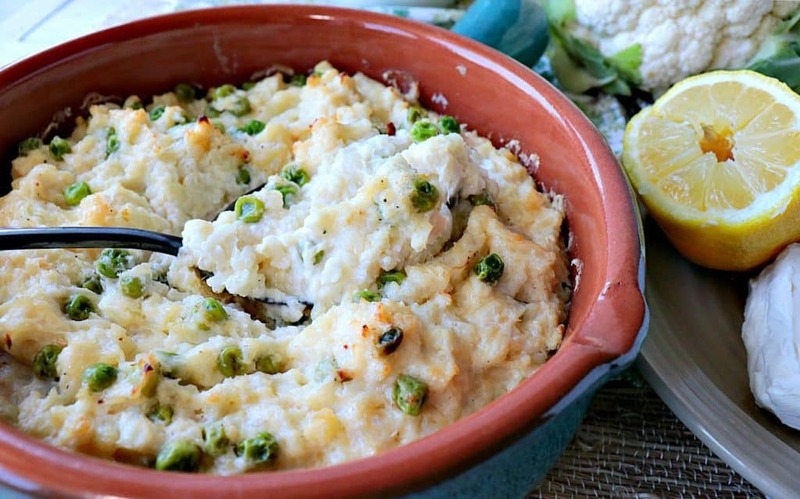 I sincerely hope you’ve enjoyed this recipe for Easy Cheesy Mashed Cauliflower Casserole with Peas (which just happens to be keto and low carb) as much as I’ve enjoyed bringing it to you. Should you have any questions regarding this recipe for Best Easy Cheesy Mashed Cauliflower Casserole, or anything else you’ve seen on my site, please don’t hesitate to contact me directly or leave me a comment in the comment section below. It is always my distinct pleasure to get back to you with a reply just as soon as I possibly can! My husband claims not to like cauliflower, but with this recipe, I have no doubt he will be in love in no time!! You can, but then I’d suggest leaving out the lemon juice. Since the sour cream already has a tangy acidic flavor, the lemon juice would be overkill (in my opinion). Also, the completed dish may be a tiny bit thinner in consistency, but it should be objectionable.